Iloilo to Boracay: The American Expat in the Philippines. Apologies for not having any recent posts but my lovely asawa and I, along with niece Shaina, and sister Marjorie, who was on vacation from her job in Kuwait, visited one of the most beautiful beaches in the world, Boracay. Now you might wonder why the crusty old expat would take another vacation since we recently returned from two visits to the Queen City of the South, Cebu. Truth is, Marjorie, mother of Sherwin and Shaina, our niece and nephew that reside with us in our new house in the Philippines, was bored. My wife’s sister has been working in Kuwait as an OFW, Overseas Filipino Worker, for over six years and hasn’t seen her children since she left the Philippines. Marjorie is used to working all the time and I thought she deserved a break. Regular readers of Philippines Plus will know that I am on a perpetual vacation and excel at doing nothing. We had first decided to take a trip to Dumaguete, a university city situated on the plains of the southeastern coast of Negros Island near the mouth of the Banica River. Dumaguete, ranked as the 9th Best City in the World to Retire by US News & World Report, was a place my asawa had wanted to visit before we decided on a return trip to Cebu with another niece and nephew in Guimaras. I scoured Al Gore’s World Wide Web searching for the best travel options to Boracay, said to have some of the most beautiful beaches in the world. Flying there was not an option, too expensive to book a trip at the last minute. So I checked out other ways to visit Boracay from nearby Iloilo and decided we could travel by bus or van to Caticlan, Aklan. The bus route terminates at Caticlan Jetty Port, which is a mere 10-minute ferry ride from Boracay Island. I walked into our living room and announced that I had a Plan B. “What is your ‘Plan B’?” my ever-patient wife inquired. A crackle of electricity sung through the air. I had accidentally blundered my way into scoring major points with my asawa. Well, OK, maybe it wasn’t that accidental. My spouse and I have talked about going to Boracay before. We took off the next morning. Our crew of four, my wife and I along with Marjorie and Shaina hopped on a banca boat from at Jordan Wharf from our island province home of Guimaras to nearby Ortiz Wharf in Iloilo City. Sherwin did not want to go. He’s been too busy standing by a window checking text messages from his Facebook girlfriend and opted to stay at home. From Ortiz Wharf we took a taxi and asked the driver to take us to Tagbak Terminal, the largest land terminal in Iloilo and a popular transit point for Boracay-bound tourists, according to the Explore Iloilo website. It was only supposed to be a 150 peso ride to the terminal. The driver began asking my asawa some questions in the local language, Hiligaynon, often referred to as Ilonggo. We passed up Tagbak Terminal and stopped at a transport company/convenience store 25 more pesos away. We immediately were met by a man in the next photograph who had waved us in. We were soon whisked away into a waiting passenger van faster than Chris Christie heading for an all-you-can eat buffet table in New Jersey. Turns out my wife didn’t want to take the Ceres Bus at Tagbak Terminal and opted to take a passenger van at this location for private transportation vans to Boracay. The van’s fee to Caticlan was only 350 pesos each for the almost five-hour trip so I couldn’t complain plus it had air-con, another big plus. It wasn’t long before the 15-passenger van took off though it wasn’t full. We had other passengers to pick up. We sat in the back but should have sat right behind the air con vents in front of one row of seats. I though the back row would have more leg room. It didn’t. On our return trip home we sat in the first row of seats, not the front seats, and had plenty of room behind the driver and front seat passengers to stretch our legs and put our luggage. After one pit stop for our van driver who peed alongside the road and another couple of stops to let out passengers not going to Boracay, we arrived at the Caticlan Jetty Port about five hours after leaving Illoilo City. 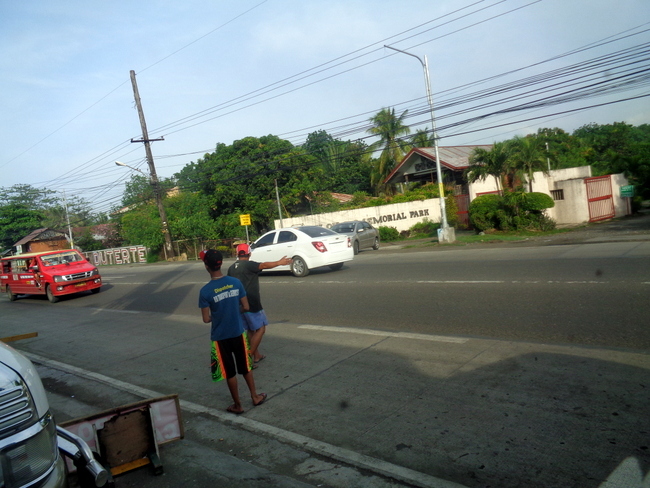 It was an adventurous journey as we darted in and out out of traffic and sped around slow-moving tricycles and jeepneys along the way. If you’ve ever been to Mr. Toad’s Wild Ride in Disneyland, you have a sense of what this trip was like. Massive amounts of people were at the port most of them spewing forth from the gargantuan passenger buses. It was the usual scene of chaos I’ve seen at any port in the Philippines. My asawa, along with Marjorie and Shaina, headed for the nearest Comfort Room, CR, as I waited outside with our luggage as my stomach growled. It was 1:15 pm and none of us had eaten all day. Hopefully, we would be able to find our way to Boracay and find a place to stay and feed our bellies. I have rode in a couple of the mini-size passenger vans also, but they are far to small for me and my legs, very cramped and uncomfortable ride, hope your was better. I will be interested to hear about your trip to Boracay Dave, we went there 2 years ago, it was ok, but kinda seemed like Hawaii in that its so commercialized compared to all other places I have been there. We like places that are not so crowded and Boracay was very crowded, but it may just have been the time of year we were there.Hope your trip was a good one. Is so sad that so many have to be OFW’s like your sister-in law who misses so much of the growing up years of her children, but I know it must be done to support her family, but it too bad things have to be that way for so many there. It was cramped in the van on the way over, Bill S., but I wised up on the way back and got behind a row of seats right behind the driver, plenty of leg room. The driver on the way back also made a CR stop for all the passengers and gave us time to purchase any drinks or snacks. I imagine the drivers are paid by how many trips they make and don’t like to make a lot of stops. 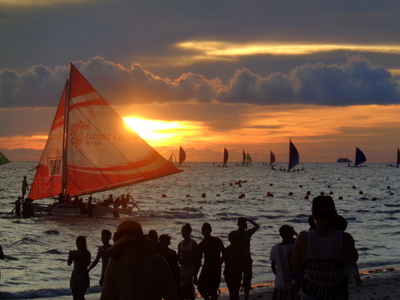 I’ll have more on Boracay coming up, but you’re right, it is very commercialized and extremely crowded. But they do have some beautiful beaches, I will say that. Yes, though government officials here always give a lot of lip service and promise more jobs for Filipinos in the PH, it’s only a lot of hot air. Maybe the new president can fix that, we will have to see. We took a 6 hour van ride in Palawan and had a similar experience. The best leg room was the seat behind the driver. Fortunately I am not tall so it wasn’t too bad. Nope, Rease, though I suggested the bus, Melinda wanted to take the van. She thinks the bus is more dangerous. But at least I had more leg room on the way back. Take care. Have to agree with Rease above, the bus would be much more comfortable than those vans they overload. We are enjoying the cooler weather here in Ohio and being able to drive again. Hope you guy’s had a wonderful time there and missed all the rain. Nope, Papa Duck, Melinda wanted no part of the bus. She thinks riding the bus is more dangerous than riding the van. We missed the rain in Boracay but did get a good right early this morning in Guimaras. We’ve been getting pretty good rains here lately. Good day.Nice extended family ya got there!Filipino families are the best!When you’re in,you’re really in forever.Sometimes it goes the other way,but not too often.It’s not the money thing.If they don’t like you,they let you know it right fast.My brother-in-law had a little diesel van,and we travelled hundreds of miles in it,quite comfortably,but toy-ike compared to American vans.I still prefer the amiability of the jeepthing.Joe. When you marry a Filipina, Joe, as you know, you also marry the family. My sister-in-law Marjorie can’t quit helping out around the house even though she is on “vacation.” Everyone is expected to pitch in around here and they do. Well, almost everyone. I’m the guy who excels at doing nothing. We still take the jeepney when we travel in nearby Iloilo City, Joe. Doesn’t make sense to pay 1,000 pesos for a round trip on the ferry with our truck when we both can hop on a “cheapney” for only 7 pesos each. Joe, the labor cost 40,000 to have our new home, the interior of which is 358 sq. meters, about 4,000 sq. ft., wired. Very reasonable. Our two electricians did quality work. I figured my sister-in-law deserved a break, Derek. Six years is a long time to go without seeing your own children. We don’t fly when we take our trips, Derek. Always found it cheaper to use the various shipping lines or van transport, as we did in Boracay. Sure, it takes a lot longer, but I don’t mind. Remember, I’m the “Do Nothing” King of Guimaras. We had a good rain this morning, Derek, and the rains have cooled things off, thankfully. Thanks,Dave,for the info on wiring.My wife says the rewiring is “necessary”,and I know enough by now to leave it at that.By the way,she makes an excellent mango cake,but she says Guimaras mangos are almost too sweet.Do I detect a provincial rivalry here that may flare up into a Mango War?Joe. Hi Dave and Melinda kumusta. Been vsiting your site quite sometime now. Would really like to met you if you hañpen to visit dumaguete we moved back here for almost two years now. So sorry its an off topic. Hope Majorie had a good trip back. Hi, Alma. First of all, thanks so much for following my site. The fact that you’ve stayed with Philippines Plus for almost two years now is a testament to your tolerance and patience. Actually sir got your site through bobs site. The mindanao bob. You both sre amazing writer. Yes we would like to meet you and melinda. Please let us know so we can take you around. Theres so many nice beaches resort around here. Please contact us or i can give you all the resorts name. Sure, I used to write a few posts several years ago for Bob’s site. Good guy. I appreciate the kind words, Alma. Will be in touch once we get a firm date for our visit. Thanks so much and take care.